I bought a jar of Marjoram at a street fair and it worked!!!!! So, I want to buy 3 more jars. According to my wife, this is the first time I have not snored in decades. Mike G.
I bought a jar of Marjoram from you...and was very skeptical about whether or not it would work for my husband&apos;s snoring. Just wanted to let you know that I have been sleeping very soundly! You asked me to email you to tell you if it worked or not...it does!! 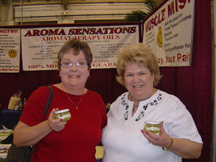 --Sue W.
We saw you at the Del Mar show ... and bought some Marjoram. My husband hasn&apos;t snored much at all since. I would like to order 2 more jars... we absolutely love your stuff! --Martha G.
We were at the Sacramento Home Show at Cal Expo where we saw your booth. I talked to you briefly about the Marjoram for snoring but walked away. Then I came back and purchased one of the Marjoram for snoring. I have to say it is awesome. My boyfriend is, or should I say was, a very heavy snorer. In fact, if he would fall asleep before I would every night, I would end up on the couch. At times, his snoring would even wake me up. The very first night he opened the jar and took a few sniffs then we left the unopened jar on the stand by his bed. He fell asleep before me as usual. I could barely hear him breathing, but not one bit of snoring. We have been using it faithfully since Sunday, April 6, 2003, and it is truly amazing. IT WORKS! - Aliza L.
Hi Bree, I met you at the Vacaville Home Show and bought the snoring Marjoram. I&apos;m pleased to tell you it works and it took around 10 days but I am really pleased. When I get off vacation I will be ordering more stuff. Thanks a million. Sincerely, Diana S.
Hi! We were at a street fair in San Francisco this past June and found your booth. My husband of 41 years was a world-class snorer and occasionally I would end up on the couch after a restless and sleepless night. After listening to you tell us the benefits of the oil of Marjoram for snoring we decided to try a jar. It seemed an inexpensive noninvasive option and if it worked would be a lifesaver. He didn&apos;t like the feel of the Breathe Right strips on his nose, and they did not work anyway. That night, at the B&B, he took 3-4 deep sniffs and kept the jar open on his side of the bed. I cannot explain to you the surprise and joy the following morning when we realized that he had slept soundly through the night; I never even heard a snuffle! He was so well rested and amazed the oil had worked. I know you had said to give it 1-8 weeks but this worked from the first night and has continued to work 6 months later. If he forgets to use it, he snores, so I open the jar for him during the night and all is well. I have told all our friends and they, too, were skeptical, but when I told them that it truly works they were going to try it also for themselves or grown children. I&apos;m going to reorder and also try the Muscle Mist in the hopes it will alleviate the pain I have in both thumbs from osteoarthritis; I&apos;m trying to avoid surgery. Thanks again for an incredible product. Helen from CT. Purchased your product for my husband&apos;s snoring over the summer at a flea market in New Mexico. Just wanted to let you know I don&apos;t have to kill him now; it really works!! Just wanted to take a minute to let you know. THANKS - N.B. Dear Chris: About 6 months ago, I ran into your display at one of the home shows (I think it was Ontario). I&apos;ve used Lavender for relaxation for a couple years and so when I came to your display I was slightly interested. I noticed you had a therapy for snoring. I remember joking with you that I&apos;d pay darn near anything if it helped my husband&apos;s snoring. He was standing there with me & his comment was his "snoring doesn&apos;t bother him at all." I thought, "What have I got to lose?" We bought 1 large jar. The first night, he smelled the jar 5 times, left it open on his side of the bed and it worked!! It&apos;s been working ever since. Some nights he forgets and when I get woken up by his snoring, I just quietly go to his nightstand, open the jar & place it on top and within about 15 minutes the snoring is stopped. A couple weeks ago, my son, 28 yrs old, wife and granddaughter (3 yrs old) were here visiting. They were all sleeping in one room and his wife and the 3-year-old were complaining about my son&apos;s snoring keeping them up! I grabbed our jar and had him try it. It worked!! I&apos;m buying another jar today for him!! I want to thank you for bringing this therapy to my family! It&apos;s a blessing to at least 3 females in my family!! I&apos;m sure on some level the men are blessed, too. Sincerely, Sharon F.
My husband was a hopeless snorer. We met your representatives at a Home Show in Sandy, UT. She was so enthusiastic about your product and countered knowledgeably every question my husband put forth. He is a great talker and the rep could out-talk him... that&apos;s when I started to listen. With the money back guarantee, I convinced my husband to take the chance... his snoring was a subject of my sleeplessness and I welcomed the possibility to have a quiet night&apos;s sleep. She emphasized the 4-6 week adjustment time, so home we went. The first night was unbelievable. We used the product as directed, and he was snore free!! We were anxious for the next night to see if it would happen again!! IT DID!! Since then we have had quiet, snore-free nights. When he does snore, I know he has forgotten to use the Marjoram product. I am telling friends and family about your product and buying others based on the success of this first success. Thank you for a natural remedy to this problem! -- Sandy H.
Hi! We want you to know how happy we are that we found your aromatherapy oils. We went to the home and garden show in Sacramento, California, where we were attracted to the Marjoram that we saw in your booth. Both my husband and I had been disrupting each other&apos;s sleep with our snoring and frequently had difficulty going back to sleep. Well, we bought a large jar of Marjoram, tried it and discovered that it really works. We rarely snore and we seem to be sleeping more deeply and we are able to sleep the whole night through. At 67, that&apos;s saying a lot. We are two happy seniors that are thankful we discovered your products. We are placing an order today so that we can give them away for birthday gifts. Gratefully, Bob and Teddy from Northern California. Bree, I saw you in the November at the Country Folk Art Show, and I bought your fabulous Marjoram for snoring and it&apos;s awesome !!!! I stopped snoring the first night. I get more restful sleep and you can feel it open up my airway and passage ways. I use it everynight. I recomend it to all my friends. It&apos;s a miracle !!! I can sleep with my husband now. Here is my friend who also uses the Marjoram and the Muscle Mist. My husband and I were at the Alaska State Fair on August 31st. We&apos;ve seen the product before but kind of blew it off as being too good to be true. He snores like a freight train and most of the time I have to move to either the basement or the living room once he comes to bed so I can sleep. This year we thought what the heck, can&apos;t hurt to try it so we bought the Marjoram. It doesn&apos;t totally stop his snoring but does tone it down so that I now can sleep with him again. Couldn&apos;t really believe it until he tried it. Now I&apos;m a believer and I&apos;m passing on information about this product to friends and family. Wish you had a small size for him to use when he has to go on road trips. He goes out of town several times a year for his job and the small size would be great for his suitcase. Raini & Rob Cacy - Anchorage, Alaska. My husband used to snore so loudly I could hear him from down the hall with two closed doors between us. I bought a bottle of Marjoram oil at the L.A. Fair and he stopped snoring within two nights. Now the only time I hear him snore is when he forgets to open the jar. 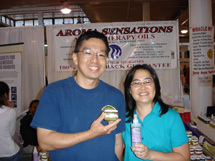 Alice D.
My husband and I visited the Aroma Sensations booth at the Redlands Market place a few weeks ago and got closer when I heard that there was a treatment available for snoring. We came over to speak to Bree who was kind enough to walk us through the steps in getting him to stop in a matter of days. The first night my husband rubbed a bit of oil under his nose to accelerate the chances that he wouldn&apos;t snore. After that night, he has not snored once. Marjoram really WORKS! I also bought Pine for my allergies and Ylang for stress reduction and relaxation and the Muscle Mist for my pre-workout (this really works on loosening the muscle and diminishing any pain that might exist). Many of my co-workers are interested in their products now. Now I&apos;m buying for family members that need help with arthritis! Jackie G.